The 10'3" kayak has a 275 lb. 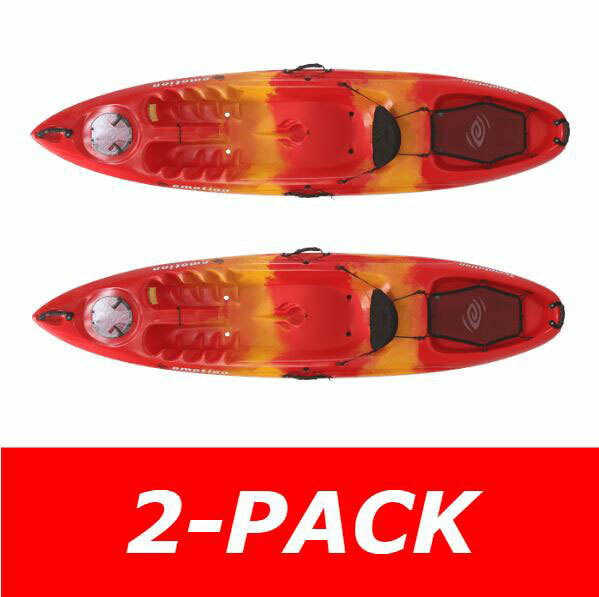 weight capacity and comes in red/yellow. 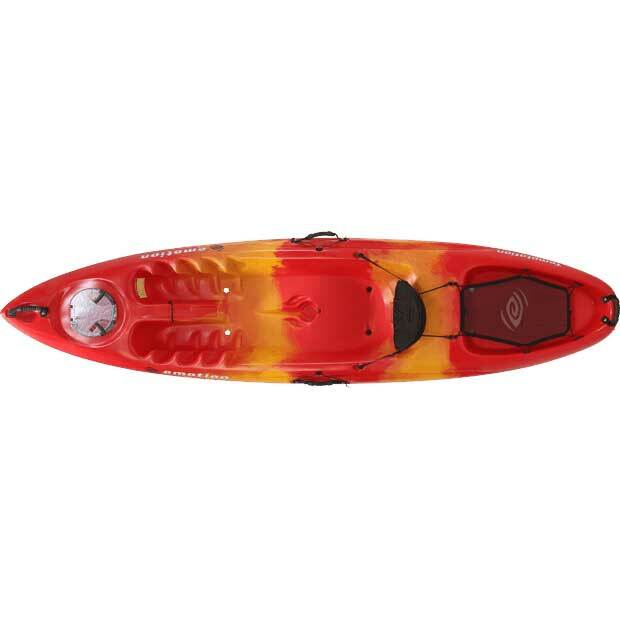 This model is a "sit-on-top" (SOT) kayak and comes with a padded CRS backrest, self-bailing scupper holes, rear tankwell with cargo net cover, 2 paddle keepers, luggage handles on the bow, stern and both sides, an 8" locking hatch, and molded-in footwells. Roto-molded with a 5-year limited warranty on hull. Q: Will you get wet from the holes in the kayak? A: That's a very good question you asked. Those are called scupper holes and they have a very specific purpose. Many people use kayaks are familiar with them, but if you have never owned a kayak you might be a little bit puzzled why they exist. Scupper holes allow for water to drain from the top surface of the kayak and down to the lake. Let me give you an example. If your kayaking on a very hot day and getting in and out of the kayak to cool off in the water, then obviously you're going to get some water on the kayak. Naturally, the kayak will accumulate more water as you continue to get in and out. The scupper holes allow for that water to go back into the lake so you can dry off. Another example is if it's raining. Many people kayak regardless of the weather and the rain or splashing waves also accumulate in the scupper holes allowed to drain. Of scupper holes go directly through the kayak, but they don't actually go inside the kayaking anyway. The holes are sealed off so that water only comes from the top of the kayak down to the bottom. Some customers wonder if they are too heavy and if water will come up, because of the excessive weight. That is also not a concern. As long as you are within the weight capacity of the kayak there should not be an issue with water coming up. Now, some of our kayaks are equipped to handle choppy water and River waves. Therefore, going up and down like that could potentially invite some water to come up to the holes. That's usually not a concern for kayaker since it still drains once the kayak stabilizes. But, some people use scupper plugs which are basically foam plugs that you squeeze into the hole. We do sell scupper plugs separately, but personally I simply take those foam swimming noodles and cut out round pieces that I can jam into the holes. It seems like my children will lose them anyway and so it's an inexpensive way to replace them from time to time. If you have any other questions please let us know. If you find this answer hopeful please click on the link that says this answer was helpful.